On behalf of the dedicated employees of the West Wildwood Police Department, thank you for taking the time to visit our website. We are committed to protecting, preserving and safeguarding the constitutional and civil rights of our citizens through professional and impartial law enforcement. We shall ensure public safety and provide quality service, in partnership with our community, through superior training, integrity and diligence. I believe this is what makes the West Wildwood Police Department one of the finest law enforcement agencies in Cape May County. In addition to the department’s continuous efforts, Mayor Fox and our Borough Council have made public safety a top priority. We rely on their support and the support of our citizens in order to successfully achieve our mission. We look forward to serving you with duty, honor, integrity and professionalism. 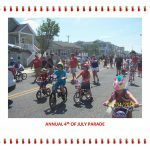 In accordance with the State of New Jersey Attorney General’s Policy On Internal Affairs, the 2016 end of the year report for the Borough of West Wildwood Police Department, is detailed below for the publics’ review.